While there is no guaranteed way to avoid colds and flu, there are plenty of small changes to your daily life that you can make, that help reduce the chances of you picking up a bug. These range from simply washing your hands more often to sleeping better. Today I share 10 simple tips to help prevent a cold or flu. It's handy to know what you should do when you have a cold, what to eat, and what natural remedies can help, but sometimes the best way to deal with colds and flu is to avoid catching them in the first place! 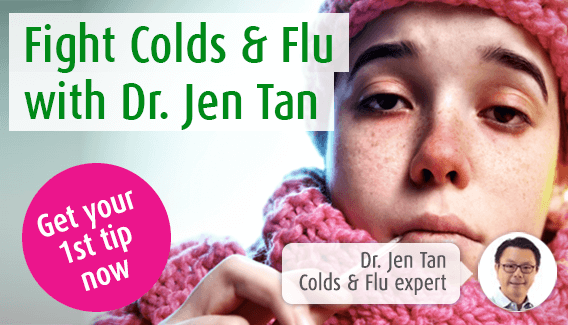 Read my top 10 tips below to help you avoid catching a cold or flu. Common cold and flu viruses spread by direct contact. Avoid people with colds or the flu like the plague – viruses spread from their hands to door handles, the telephone or the keyboard and can live for hours on these surfaces. The next person touching the same object will pick up these bugs, so wash your hands often or use alcohol-based hand sanitisers to prevent these viruses passing into your body. Take care to wash or sanitise your hands before you eat and when you get home from work. Achieving restful sleep each night (8 hours) helps the body repair itself and build the immune system. If you need help sleeping, see our tips on how you can sleep better. Avoid becoming dehydrated – a typical healthy adult needs around 1.5 litres of water each day. Drinking water flushes out your system and helps keep your immune system strong. It is well known that stress can weaken your immune system and may make you more likely to catch a cold than your calmer counterparts. A diet rich in fruit and vegetables can help you avoid many health problems. Foods rich in vitamins A and C such as citrus fruit, dark blue and red berries, mangoes, apricots, carrots and beetroot support the immune system. In addition, avoid refined sugar as much as possible as this can interfere with both digestion and the immune system. Make sure to eat plenty of protein as well as this keeps the body strong and healthy. Avoid getting stuck in a room full of people with stale air. Find fresh air and breathe deeply. This helps the lymphatic system move protective immune cells around the body. Even though it's cold, try opening the window for a few minutes every hour for a blast of fresh air. If you're on a plane heading to or from some winter sun, try using our Echinaforce Throat Spray to keep cold and flu viruses at bay. Exercise helps to boost circulation which makes it easier for immune cells to get around the whole body, searching out viruses. It also stimulates the lymphatic system which helps to eliminate toxins and waste. Why not combine this with the previous tips, and exercise outside instead of in the germ-filled gym? The combination of fresh air and exercise will do wonders for preventing colds and flu! This is an irritant to the delicate tissues of your respiratory tract and increases your susceptibility to viruses that cause colds and flu. Smoking cigarettes also depletes the levels of vitamin C, which we all know is incredibly important for immune function!